This is awesome. Going to order some kit when my next pay check comes through! Here's the updated design with the green stripes on the long sleeves and the writing going up and down the short sleeves rather than round the cuff. Is there a cap available? Those designs shows the pattern for a "cotton hat", but it doesn't seem to be listed on the Impsport page. There's all sorts of stuff listed here, http://www.impsport.com/content/pages/i ... celist.pdf which I take it is the full list of club items. [quote="Big Good Wolf"]Here's the updated design with the green stripes on the long sleeves and the writing going up and down the short sleeves rather than round the cuff. Do hope they've dropped everything else at Impsport so they can get mine done smartish! 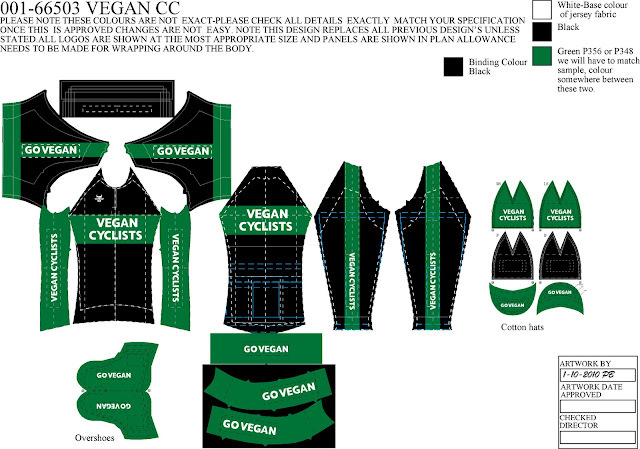 Should I/we point the Vegan Runners group over on facebook at the Impsport shop - I suspect some of them cycle? You need to enter VEGC1235 as the password. Thanks to Gastroplodder, who had both a Vegan Runners vest and a colour chart to hand, I've given Impsport the correct colour code for the green. Hopefully, his kit should arrive soon and a picture of it should appear on Impsport's web site. My Vegan Cyclists Winter Training Jacket arrived from Impsport yesterday. First impressions are good, the green near enough matches the VRUK shirt, they've spelled 'Vegan' and 'Cyclists' right, it seems well made. I'll try and embed a couple of photos. Last edited by Gastroplodder on Sun Nov 20, 2011 9:56 am, edited 2 times in total. It's probably because you have restricted sharing when uploading it to flickr, if there's no restrictions a link to the actual photo should appear in the share menu, just linking to the whole web page won't work (how would the forum software know what from that page to view?). Now you've got yours and you're happy with the colours and everything, I'll go ahead and order some winter kit for myself. They are also doing free postage on orders over £75. They are also offering free artwork and 10% off team kit. There's an on line kit designer too. I know a few people wanted a different design to the Vegan Runners inspired one we have got now, so this is your chance to do it. I haven't looked in to this, so don't know if there is a minimum order value to qualify for the free artwork. I don't know who it who has just placed an order. Whoever you are, be aware that the design of the shorts has changed slightly. [quote]"We have recently updated and improved the patterns we use for producing cycling shorts and are in the process of updating Your Club Shop clubs artwork as and when a member places an order for this item. One of your members has recently placed an order, please find your updated artwork attached for approval. This artwork will need confirming by yourself before we can proceed with the order. The new patterns have a printed panel that wraps around the leg and have been tested by our pro-teams who highly recommend them." Looks good to me, so I'll approve it.